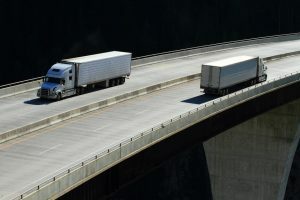 For the first time in several weeks, the price of gasoline finally began to decline, but the news for truckers was mixed during the past week, according to the latest survey from the U.S. Energy Information Administration. The average price of a gallon of unleaded fuel slipped downward just over 3¢ per gallon during the past week, according to the survey report, which was delayed this week for the Martin Luther King, Jr. Holiday. The average price of gas fell to $3.30 per gallon, and while the nationwide average cost of diesel fell about a penny, the cost of diesel went up between 1¢ and 2¢ per gallon across the East Coast, New England and the Central and Lower Atlantic regions. The price of unleaded dipped in every region of the U.S., although the declines were barely noticeable for drivers along the Gulf Coast and the West Coast of the U.S. For California, however, prices dipped as much as a nickel per gallon. The biggest price decline came in the Midwest region, which is known for wild price swings from one week to the next. Drivers across Michigan, Indiana, Iowa and Illinois felt prices drop just over a nickel per gallon, although the arrival of new winter storms this week has brought new problems at the pump, as refineries shift gears and try to meet an almost extreme demand for propane, the preferred heating fuel for many households in the Midwest. Across the East Coast, New England and Atlantic States, the price of a fill-up dropped as much as 4¢ per gallon, although the Lower Atlantic states, barely saw prices move, in line with the neighboring Gulf Coast region. While the forecast for gas prices is a long-term trend toward lower costs, the price of U.S. crude oil has been on a wild swing during the past two months, starting with dramatic price declines ahead of Thanksgiving 2013 that were completely reversed by the middle of December. The volatile West Texas Intermediate futures closed at over $95 per barrel Tuesday as the International Energy Agency – not to be confused with the U.S. Energy Information Administration – announced global crude oil demand would increase by 1.3-million barrels per day this year, about 50,000 barrels per day more than originally expected. The increase in global demand has put upward price pressure on WTI, which is also under trading pressure as February contracts begin to expire. Traders are buying additional contracts to cover their positions ahead of those contract expirations, according to a financial report on CNBC.com. The price of a gallon of gas remained flat across many regions of the United States during the past week, according to the latest survey from the U.S. Energy Information Administration. However, the national average, which remains at about $3.33 per gallon, hardly tells the story for most areas, including the West Coast and New England, where prices edged higher by about two cents. For the broader East Coast and the Lower Atlantic states, the price of gasoline nudged higher by more than 3¢ per gallon. It was the Midwest region’s 4¢ per gallon price decline that tempered the increase in the national averages. The result is what appears to be a flat week-over-week price point, even though most Americans are paying higher gas prices. The cost of fuel in the Midwest dipped by an average of 4¢ per gallon during the past week, helping ameliorate a nasty series of price increases, particularly last week, which had troubled the region during the holidays. The price of fuel across the nation’s heartland was about $3.07 in the middle of December, but it ended 2013 with average prices having soared to $3.26, and higher in some areas across the midwest. 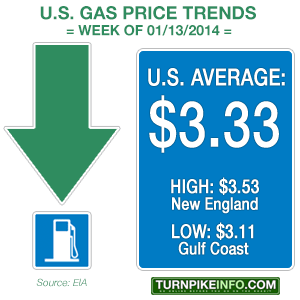 The current average has slipped downward to $3.22. The price of diesel also remained nearly flat across the nation during the past week, although the average price per gallon did go up, from $3.90 to $3.91. However, extreme pricing can still be found in the New England states and California, where the average price in both regions is currently $4.12. The cheapest price for diesel is still found across the Gulf Coast states. 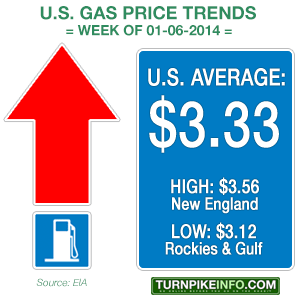 The price of gas, while declining for many months at the end of 2013, ended the year higher. Consumer gas prices for many drivers are starting 2014 higher than they were last year, and this is particularly true across the Rocky Mountain region, where the price of regular unleaded gas is 19¢ per gallon higher than at this time one year ago. For truckers in the Rockies, the price of diesel is 21¢ higher, per gallon. The Rocky Mountain price averages are extreme examples, however, as most Americans, while paying higher prices for gas, are only paying a few cents more per gallon as 2014 starts, versus 2013. Drivers across the Gulf Coast and the Lower Atlantic states are actually paying less, compared with last year. Diesel drivers are also paying less; in fact, diesel prices across the East Coast and Lower Atlantic states are upwards of 6¢ per gallon less; however, truckers and other diesel car drivers in California are paying as much as 7¢ per gallon more, demonstrating a broad disparity in the distribution of gas prices, from state to state and region to region.